Based on an idea by Mary Pardoe. NOTE: the "Non?" in the title was added August 2012 because this is a discussion of a variant of Euclidean geometry extended with processes involving movable structures, and therefore time. It is not clear to me whether the result turns out to be a superset of Euclidean geometry. It seems not to involve the parallel postulate, and therefore to be a different geometry, unless the parallel and the new postulate can be derived from each other. NB: This is still work in progress, and likely to be changed/extended. 10 Feb 2016: Added inverse rotations and an axiom for "reverse rotations" that adds the Euclidean property [below]. 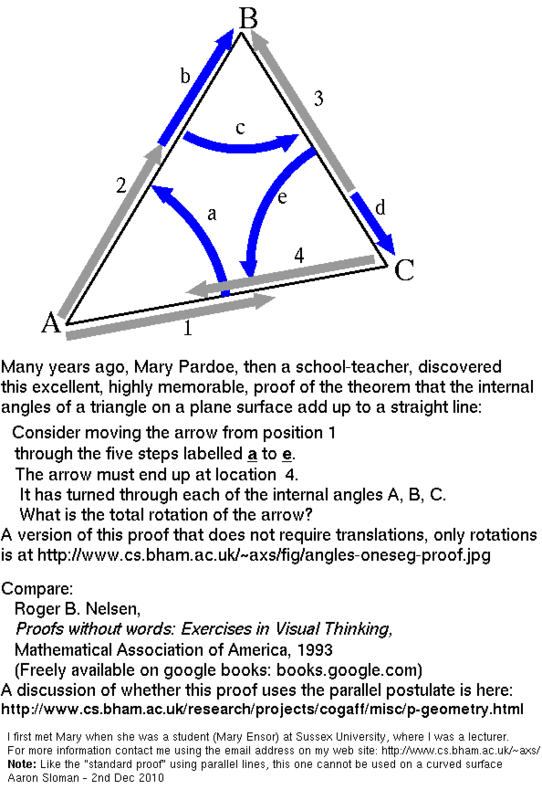 29 Mar 2015: Added link to discussion of angle trisection and Poincaraé's philosophy of mathematics. Some reorganisation and re-formatting. The PDF version will probably have formatting flaws, and may not be up to date. For over half a century I have been interested in the role of intuitive spatial reasoning in mathematics. My Oxford DPhil Thesis (1962) was an attempt to defend Kant's philosophy of mathematics, especially his claim that mathematical proofs extend our knowledge (so the knowledge is "synthetic", not "analytic") and that the discoveries are not empirical, or contingent, but are in an important sense "a priori" (which does not imply "innate") and also necessarily true. 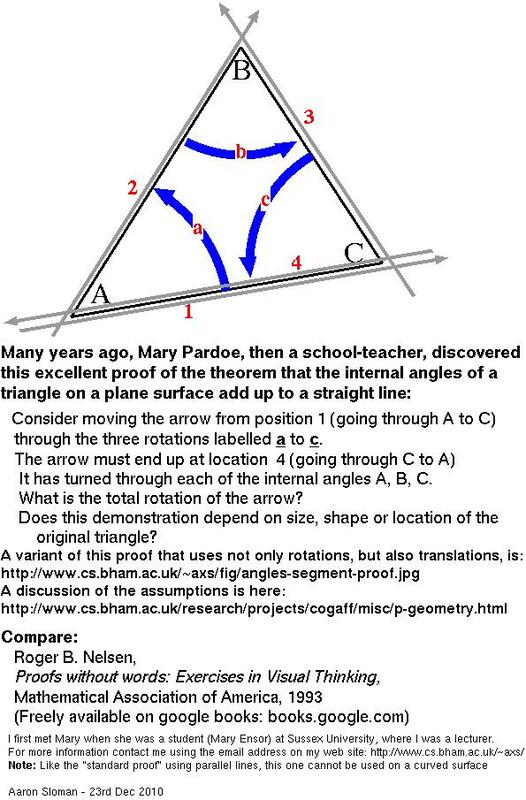 I had made my views clear in courses on philosophy of science and mathematics when teaching at Sussex University (from 1964) which was why one of our former students, Mary Pardoe (then Mary Ensor) who had become a mathematics teacher informed me, while visiting the university, that she had found a new diagrammatic proof of the triangle sum theorem. I reported her proof in some papers and presentations on methods of representation and reasoning, e.g. here, but neither she nor I has encountered anyone else who knew about the proof. So, in November 2010, I decided to try to get comments on it from experts by writing to a mailing list on mathematical knowledge management (MKM). In particular the discussion led me to attempt a partial formalisation of what I think the proof assumes about moving, rotating, line segments as explained below. There is a lot more work to be done, including clarifying the difference between adding time and motion to Euclidean geometry and merely adding sets of locations (or paths, loci) of geometrical entities to geometry without time. The angles of a triangle add up to a straight line (180 degrees). which can be formulated in several equivalent ways, e.g. Two straight lines L1 and L2 are parallel if and only if they are co-planar and have no point in common, no matter how far they are extended. Given a straight line L in a plane, and a point P in the plane not on L, there is exactly one line through P that is in the plane and parallel to L.
Then the angle that L1 makes with the line L3 at point P1, and the angle L2 makes with the line L3 at point P2 (where the angles are on the same side of both lines) are equal. Then the angle L1 makes with the line L3 at point P1, and the angle L2 makes with the line L3 at point P2 (on the opposite sides of both lines) are equal. The page teaches concepts with some interactive illustrations, but presents no proofs. Warning: several online proofs seem to have bugs due to carelessness. Many years ago at Sussex university I was visited by a former student Mary Pardoe (then Mary Ensor), who had been teaching mathematics in schools. She mentioned that her pupils had found the standard proof of the triangle sum theorem hard to take in and remember, but that she had found an alternative proof, which was more memorable, and easier for her pupils to understand. Her proof just involves rotating a single directed line segment (or arrow, or pencil, or ...) through each of the angles in turn at the corners of the triangle, which must result in its ending up in its initial location pointing in the opposite direction, without ever crossing over itself. So the total rotation angle is equivalent to a straight line, or half rotation, i.e. 180 degrees, using the convention that a full rotation is 360 degrees. The proof is illustrated below. Available as printable PDF here. If Learning Maths Requires a Teacher, Where did the First Teachers Come From? The presentations produced no responses -- either critical or approving, except that in an informal discussion recently a mathematician objected that the proof was unacceptable because the surface of a sphere would provide a counter example. However, the surface of a sphere provides no more and no less of a problem for Pardoe's proof than for the standard proofs since both proofs are restricted to planar surfaces. There may be interesting generalisations of both proofs that are applicable to non-planar surfaces, but that's not the present topic. I tried searching for online proofs to see if anyone else had discovered this proof or used it, but nothing turned up. The proof using rotation is so simple and so effective that both Mary Pardoe and I felt sure it must have been discovered previously. In November 2010 I wrote to the Mathematical Knowledge Management Interest Group (MKM-IG) mailing list, pointing at the online presentation of the proof and inviting comments. I included a reference to Nelsen's "Proofs without words" (see below), as evidence that there was nothing new in the idea that a serious mathematical proof can be based on transformations of a diagram. In particular, I invited comments on the possible use of the rotating segment proof in mathematics teaching. On this view the proof as presented is incomplete, and completing it would show it to be a variant of the standard proof. A variant of comment (1) was the objection that the proof should not be used in teaching because as it stands it is not valid, and making it valid would require presenting axioms for Euclidean geometry that are assumed in the proof. This would then replace the Pardoe proof with something like the standard proof. I think this objection was based on an unproved assumption that it is impossible to prove the triangle sum theorem without assuming the parallel postulate (or something equivalent). The assumption is correct for some axiomatisations of Euclidean geometry. Since there have been different axiomatisations of Euclidean geometry over many centuries and rigorous formal axiomatisations were not possible before the developments of logic in the late 19th century, there must be a way of identifying what Euclidean geometry is that is independent of the way in which it is axiomatised formally. This seems to be connected with Kant's view that assuming something like Euclidean geometry is a requirement for perception and action involving objects in space. The refutation (by Einstein's work on relativity) of Euclid's 5th postulate as a characterisation of physical space still leaves a great deal of Euclidean geometry (including its topological subset and much more) intact. Other comments pointed to various online demonstrations of mathematical properties of geometrical constructions, applications of pythagoras' theorem, algebraic formulae, etc. which could be used by students of mathematics to develop familiarity with the concepts and fluency in their use. Such development of mathematical intuitions is not the same thing as presenting a proof. In order to justify my assumption that the Pardoe proof was both intrinsically different from the standard proof, and to meet the objection, (1) above, that its assumptions are unclear, I decided to examine some existing axiomatisations of Euclidean geometry and thanks to google found Hilbert's and Tarski's axiomatisations, along with others. This led me to begin investigating the possibility of an alternative axiomatisation that included the notion of moving and rotating lines and other objects as primitive. I append the work in progress below, in the form of a partial axiomatisation. There are some mathematicians and logicians who claim that only a formal (logical) proof can be a proof (e.g. some followers of the Bourbaki school, whose influence I believe seriously harmed the education of many young potential mathematicians). In issue 73 (2010) of https://www.ncetm.org.uk/resources/28649 the NCETM secondary magazine (edited by Mary Pardoe) there is a piece on mathematical education by Benoit Mandelbrot, also relevant to this discussion. To claim that only formal logical proofs are proofs ignores all the deep mathematical advances over many hundreds of years (including Euclidean geometry) that preceded the development of formal approaches. Of course that begs the question: what makes a diagram, or a transformation of a diagram (or anything else) a proof as opposed to a mere intuition-builder? constraints on that set of possibilities. NOTE: I discussed both of these points in my DPhil thesis and in various papers and presentations since then, e.g. I recently discovered that the two last books Piaget wrote were on Knowledge of Possibility and Knowledge of Necessity. I have not yet read them, but it seems that he had noticed the points being discussed here. J.J.Gibson's concept of perceiving and understanding affordances is a special case of the concepts of knowledge of what is possible and what is necessarily the case in various possible situations and processes. I don't believe Gibson, or most of his followers understood the general point. A great deal of mathematical knowledge, especially knowledge of geometry and topology, is concerned with facts about what possible changes are possible in a given configuration and and what the constraints on those possibilities and the consequences of those changes are (these are the necessities). The use of diagrammatic reasoning in mathematics depends on the fact that there are ways of producing spatial structures and processes transforming such structures, that reveal both possibilities for variation and also invariances at various levels of abstraction that constrain those variations. (Likewise logical or algebraic reasoning depends on the fact that there are ways of transforming logical or algebraic expressions that reveal both possibilities for variation and semantic invariances -- e.g. applying certain rules in a certain order to a starting formula will necessarily produce a particular final formula (e.g. a theorem)). It became evident in some of the discussions and presentations at the Mathematical Practice and Cognition Symposium at AISB2010 that some researchers on mathematical cognition, especially non-mathematicians, seem to confuse diagrammatic reasoning with use of metaphors. This is a serious error that is based on a failure to understand the nature of mathematics and the difference between a suggestive argument (which could be a metaphor) and a proof, which demonstrates what must be the case. I don't know to what extent the many people who are now building web sites for mathematical education understand the difference. Both intuition builders and proofs can transform the mind of the learner. But they do so in different ways -- partly like the difference between showing children how to use light-switches and teaching them about opening and closing electrical circuits. The latter type can explain why various generalisations hold: a deeper change. Another common view is that the fact that humans sometimes use diagrams for mathematical reasoning is just a fact about human psychology, ignoring the fact that it depends on facts about space and spatial transformations that have nothing specific to do with human psychology and might be usable by other animals and future intelligent robots. The facts that some humans can and others cannot use diagrams are psychological facts, and there are also sociological or anthropological facts about which sorts of diagrams are used in which cultures. But the study of mathematics is not the study of such psychological or sociological facts, but the investigation of deeper truths that constrain what kinds of valid reasoning are possible for any species, culture, or machine. Mary Pardoe's proof, above, and the demonstrations in Nelsen's book (see below) are relevant to investigations of the deeper truths, as I hope will become clearer below. Perhaps more people building mathematical web demos need to understand the difference, so that they can help young learners understand the differences between illustrative examples and proofs/demonstrations. One of the important facts about such diagrammatic proofs is that their effectiveness does not depend on the diagrams being drawn with great precision. For examples, the lines drawn and transformed in the proof, need not be perfectly straight, infinitely thin or perfectly circular, in order to represent properties of configurations of perfectly straight, infinitely thin, or perfectly circular lines. That's because the diagrams, whether drawn in sand, or paper, or merely imagined are not what the proofs are about: they proofs are about what the diagrams represent (as I argued in 1971). Attempting to make assumptions explicit invites discussion of an infinite regress of assumptions, like Lewis Carroll's What the Tortoise Said to Achilles (in Mind 1895). I believe it is possible to show how to terminate such discussions by showing how to build a reasoner in which instead of ever more factual assumptions we end with a demonstration of how something can actually work, and why it works, where the actual reasoner built instantiates some generic invariances that are equally applicable to other instances. (E.g. other reasoning animals or machines, whose details can differ.) But that's a topic for another occasion. For now all I want to do is show how to make some of the assumptions more explicit than they are in Pardoe's proof. Unpacking the assumptions of the proof leads to a description of a notion of geometry that is very close to Euclidean geometry, sharing many features and theorems with it, though will be slightly different from Euclidean geometry if the parallel axiom is not provable within it, or if it does not allow the notion of parallelism to be defined or illustrated. For now, all I want to do is leave open the possibility that the two geometries overlap without being equivalent (mutually derivable). I use the label "P-geometry" (for "Pardoe-geometry" or "Process-geometry") to distinguish this from standard Euclidean geometry. I think there is very substantial overlap with standard Euclidean geometry, and it may turn out that the two are equivalent though that is not obvious to me. After writing the above I discovered the chapter by Poincaré mentioned above. In the light of that, 'P-geometry' could be 'Poincare-geometry'. The book by Jean Nicod on The Foundations of Geometry, which I dimly recall reading many years ago, is also relevant. No doubt there is lots more relevant work, of which I am ignorant. There are other axiomatisations, but for my current purposes it is enough to (a) to point out that the same mathematical field (in this case Euclidean geometry) can have very different axiomatisations and use different initial ontologies and (b) to draw attention to a few of the differences to illustrate some of the relationships that can exist between a mathematical field of enquiry and an axiomatisation of the field. They presuppose different sets of primitives. In consequence, the axioms are very different. Neither Hilbert nor Tarski includes the parallel postulate in its usual form, though both include axioms that allow the parallel postulate to be derived. Both are distinct from the traditional (informal) axiomatisation that in one form or another goes back centuries. Comparing with Pardoe's proof: Neither axiomatisation includes notions of rotation, or translation, or time, or time order. Neither explicitly mentions the possibility of objects moving in space, which would require Euclidean geometry to be part of a larger space-time system. Rotations, but not translations, are used in the Pardoe proof displayed above. There is another version of her proof, which alternates between rotations and translations, to ensure that the rotating segment rotates only about one of its ends available here. I suspect there are more variants, or generalisations, of this proof. I don't know how many other formal or informal axiomatisations of geometry there are, nor what is in any of them, so I cannot make any claims about how they relate to P-geometry. There may already be an excellent axiomatisation of P-geometry that I have not found. NOTE: Insofar as there is agreement among mathematicians that Hilbert and Tarski (and also others listed on the web site with Hilbert's axioms) produced distinct axiomatisations for Euclidean geometry, it follows that there is some shared understanding of what Euclidean geometry is that is NOT defined by a particular axiomatisation, though that shared understanding provides a basis for generating and judging axiomatisations. That raises a question, which has driven my enquiry all along but may not interest others, namely what that pre-axiomatic understanding consists in. It is worth trying to produce an axiomatisation of geometry that does not include the parallel postulate, but does include notions of rotation of line segment and appropriate axioms corresponding to our intuition that a line segment can continue rotating, so that its orientation increases or decreases monotonically and continuously, even if the point of rotation changes, as happens in the Pardoe proof. This can be thought of as generalising the notion of a "locus" of a point defined by some parametrised set of relations, to the "locus" of a changing line segment. The intuitive notion of such a locus as presented in Pardoe's proof presupposes change of location in time (hence the rotation). But it may be possible to get rid of time and just talk about an ordered, continuous, set of line-segments as the locus. If the locus of a moving rotating line segment is divided into two or more parts, each will have an angle of rotation, and the sum of all the angles of rotation will be the total rotation for the locus. Additional possible axioms are listed below. This needs to be generalised later to include line segments that not only rotate but can also be translated in various directions. It's an open question (as far as I can tell) whether an axiomatisation based on that assumption (and the further items below) will turn out necessarily to entail the parallel postulate, or whether this variant of Euclidean geometry is consistent with, but does not require the parallel postulate. If the axioms do not entail the parallel postulate, but are consistent with it, then we'll have a slightly more general type of geometry than euclidean geometry, with euclidean geometry as a special case. But the theorem about angles of a triangle summing to a straight line (or half rotation) will still hold. A first draft set of assumptions (axioms) needed for P-geometry, to be combined with additional standard assumptions for Euclidean geometry, excluding the parallel axiom. There are lines (which have no ends), and line segments (each of which has two ends, and lies on a line). Lines have positions and orientations in the plane. line segments have positions and orientations on the plane. Operations produce changes of positions and orientations. A path for an entity is an ordered, continuous, complete, set of positions and orientations for the entity. This needs to be unpacked, to define the notions of continuity, ordering, etc. A set of entities with an ordering is "continuous" (weakly continuous?) if given any two different items in the set there is at least one more that is between them. The set is "inclusive" (is there a better term?) if it contains all the items that are between any two that it contains. P-01: A line segment has a position and an orientation in any plane containing it. The position of the line segment in the plane is also the position of the segment on the line containing it. P-02a: A line segment can be rotated and translated in any plane containing it. P-02b: A translation in a plane is an operation that can be applied to a line segment with a position in that plane, the initial position, and gives the segment a new position (in the plane), the final position, leaving the orientation unchanged. In a cyclic translation the initial and final positions are identical. P-02c: A rotation in a plane is an operation that can be applied to a line segment in that plane, and will give the segment a new position (in the plane) and a new orientation. P-02d: A rotation and translation can be applied simultaneously to a line segment and will produce a new position and orientation. defines an ordered continuously varying set of positions of the line segment, without changing the orientation. (A translation path). If no two positions in the set are identical the path is monotonic. defines an ordered continuously varying set of positions and orientations of the line segment. (A rotation path). A simple rotation defines a rotation path in which all the lines containing the positions of the segment have a unique point in common. That common point is the "centre of rotation" of that rotation. If no two positions in a simple rotation are identical the rotation is monotonic. If the start and end positions in a simple rotation are identical, and only those two, the rotation is a cycle. If a simple rotation of a segment is monotonic, but the start and end positions of the segment lie on the same line, but with the order of the ends on the line reversed, then the rotation is a half-cycle. P-03c: Every rotation has an inverse. If a rotation of a segment about a point P is immediately followed by the inverse rotation about P the segment returns to its original location. P-03d: If a segment S1 has only one end E on a straight line L, and a rotation R about E produces a new segment S1' that lies on L, and S1' is then translated any distance along L, in either direction, and then rotated by the inverse of R about end E then this will produce a new line segment S2 such that if the original S1 and S2 are extended indefinitely in either direction they will never meet. Modifications of this axiom should produce alternative non-Euclidean geometries. A compound rotation defines a rotation path in which there is no point common to all the lines containing the positions of the segment. A stepped rotation of a segment is a compound rotation whose path is composed of an ordered set of sub-paths each of which is simple. Each subpath of a stepped rotation, except the last, ends with a position that is the start position of the next sub-path. P-04: The difference between initial and final orientation of a segment is the angle of rotation. This is also the difference between the orientations of the lines containing the initial and final positions of the segment. OR the lines L and L' coincide, so that S again lies wholly on L.
NOTE: This assumes that the segment is rotated about a point on the line containing the segment. Allowing rotations about a point not on the line L adds extra complications, since the segment will then be constantly translated as well as being rotated, and the points common to L and the intermediate lines containing S during the rotation will all be different. The parallel postulate could be brought in by adding an axiom to allow rotation about a point not on L and then postulating a unique position during the rotation when the line through S no longer intersects L.
I don't see that we have to include this possibility. P-05-dud: The original formulation of this axiom did not allow for a segment to be rotated until it lies on the same line as before. The axiom originally stated: when a line segment is rotated there is always exactly one point common to the original and final positions: the point of rotation. P-06: when there is a unique point of rotation on the line L containing S, there are two angles of rotation through which the initial segment can be swept to produce the final segment: in opposite directions. (We can define acute, obtuse and reflex angles). P-07: several contiguous rotations can be combined in order to produce a new rotation. Perhaps it will prove possible to transform this to something more elegant and then show formally whether the intuitive ideas about rotations and translations of line segments entail the parallel postulate (which is not the same as presupposing it). P-08: A line segment in a plane has two sides. Those sides are preserved during rotations. After a full rotation the situation is indistinguishable from the initial situation. P-10: If rotation continues indefinitely the situation will alternate between a half-rotation state and a full-rotation state. S is translated away from L.
In the latter case there will be a discontinuity between the initial state, when every point of S is on L, and the set of subsequent states, when no point of S is on L.
Do we need an axiom stating that if the lines containing two segments have no point in common then there is an infinite set of additional line segments between them whose lines have no point in common. (I.e. an infinite plane between two non-intersecting lines can be swept out by a moving line. An interesting point is that intuitive notions of space inherently involve time, since motions are possible in space and motions involve time. Most of the applications of euclidean geometry in real life presuppose this, and many of the constructions used in proofs in euclidean geometry are normally thought of as things that can happen in time. Notions of translation and rotation of rigid shapes and also some non-rigid shapes with fixed sizes, e.g. inelastic strings, are essential for engineering. I don't know if an explicit axiomatisation of Euclidean space with (non-relativistic) time already exists. But it seems obvious that such a thing is required for Newtonian physics, and a modified version for relativistic mechanics. I would not be surprised to learn that some mathematician said all this long ago. I think it is close to Kant's philosophy of mathematics, but that's another story. After producing a first draft of this web page I discovered that Henri Poincaré had written an interesting discussion very closely related to the ideas here. Henri Poincaré published La science et l'hypothese in Paris in 1902. An English translation entitled Science and hypothesis was published in 1905. It contains a number of articles written by Poincaré over quite a number of years and we discuss below a version of one of these articles, namely the one on Non-Euclidean geometries. The following extract is directly relevant to our discussion. Among these explicit axioms there is one which seems to me to deserve some attention, because when we abandon it we can construct a fourth geometry as coherent as those of Euclid, Lobachevsky, and Riemann. To prove that we can always draw a perpendicular at a point A to a straight line AB, we consider a straight line AC movable about the point A, and initially identical with the fixed straight line AB. We then can make it turn about the point A until it lies in AB produced. Thus we assume two propositions - first, that such a rotation is possible, and then that it may continue until the two lines lie the one in the other produced. If the first point is conceded and the second rejected, we are led to a series of theorems even stranger than those of Lobachevsky and Riemann, but equally free from contradiction. I shall give only one of these theorems, and I shall not choose the least remarkable of them. A real straight line may be perpendicular to itself. 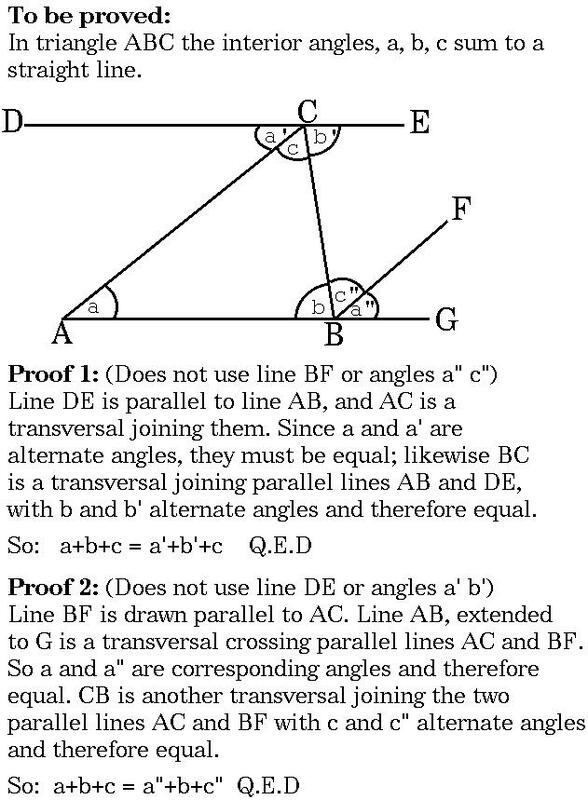 This seems to be related to the method used to trisect an angle referenced below. This includes a brief (Kantian) criticism of Poincaré's "conventionalist" philosophy of mathematics. It will be some time before we have robot mathematicians that understand Pardoe's proof, or can think about the axioms. Why (and how) did biological evolution produce mathematicians? It points out that a common philosophical argument, namely that if everything were to gradually double in linear dimensions during a period of time that would be undetectable, and therefore there is no such thing as absolute size, breaks down if space is non-Euclidean. This has implications for the status of the Pardoe proof and also the status of P-geometry. I may later add some comments about that here. 14: "The vertex angles of a star sum to 180 degrees"
From the presentation in Nelsen's book, which presents only a star with five vertices it is not clear how general the definition of "star" is for the purposes of the proof. The proof given uses parallel lines, and there is nothing to indicate how it could generalise to a larger number of vertices. Assuming that a "star" is defined as a closed, possibly complex polygon formed by repeatedly drawing lines then turning through an acute angle, always turning in the same direction, then it seems that the method suggested by Pardoe, using monotonic rotation of a single line segment about several points in the plane will prove a general form of the star theorem, provided that the number of vertices is odd. In an email discussion Peter Michor made some important-sounding comments on Riemannian geometry and conformal geometry. I am unfamiliar with both and need to learn about them in order to understand how they can help. In addition to Mary Pardoe, I owe a debt of gratitude to the various people who commented at various stages of the discussion, helping me to clarify what I wanted to say by pointing out flaws in what I actually said (at first). None of the following should be taken as agreeing with anything written above. However their comments, both critical and friendly helped to produce whatever results there may turn out to be in the rest of the document. Andrea Asperti, Arnon Avron, James Davenport, Michael Fourman, Manfred Kerber, Tom Leathrum, Paul Libbrecht, Peter Michor, Dana Scott, and of course Mary Pardoe who started it all. I have sampled only a small subset. I am aware that there has been a great deal of work on geometry about which I know nothing and that it is very likely (a) that there is nothing really new in this paper, and (b) if there is anything new it is likely to turn out to be either mistaken or not as well formulated as it should be.